When you have a large group coming to your home for dinner there a few things that can help you become a better prepared hostess. The first thing to do is don't panic! You will be amazed at the solutions you already have in your head, if you take some time to plan and think about serving items you already have on hand. When planning dinner for a large group of people, definitely go buffet style. It may be simplistic, but by way of definition, a buffet is where all the food is placed on a separate table or tables and the guest picks up plates from the head of the table and dishes up their own choice of foods. Then they carry their plate to the tables set up for eating. A buffet works well with a formal or casual meal. I always ask myself, “How can I feed everyone with the dishes and utensils I already have?” There are three answers to this question. Don't be afraid to mix and match your plates. Everyone will think that is part of your creative plan. If you want to use washable plates and don't have enough, check out your local second hand store. (I have found a couple of sets of beautiful plates and serving dishes at our local thrift store.) You can also ask a friend or family member to loan you some of their dishes. It is a good idea to coordinate the colors the best you can; stacking them so they are mixed in together lets your guests know this was all part of the plan. If you don't want to use washable plates, go for a high quality plastic or paper plate. Wrapping the silverware into packets or a nice little bundle will make food pick-up easier on the guests. Have the packets located at the head or end of the table. This keeps people from running back to the line and asking “Where are the forks, etc…. ?” Securing the silverware with a tie around the napkin keeps them intact and is a fancy addition. Kids love to wrap and tie the utensils, so this is a good place to put them to work! When you are finished wrapping, place them in a pretty basket or box. Decorations are nice on the buffet table but not necessary. I personally think garnishing the food is the best way to go. If you do use decorations, keep them in a place that doesn't interfere with the serving of the food. I would keep the table decorations for the dining area. Plan the menu and prepare as much of the food, as possible, ahead of time. One thing to remember on a buffet table is that hot dishes should be kept hot and cold dishes should be kept cold. Heating trays are wonderful and packing cold foods on ice is a good idea. It will ensure your guests feel more comfortable, as no one wants to get sick, which could happen if the foods are not kept at the right temperature. 1. Set up tables. Cover with a nice cloth that will compliment your color scheme. 2. Set the plates on both sides of the table, at the end of the table where you want your guests to start serving themselves. Place utensil bundles at the end of the food—it should be the last thing people pick up. 3. The main course should be the first item, followed by side dishes. 4. Salads and breads are next, unless they are already on the guest tables. 5. Salt and pepper shakers should be at each table, as well as butter. 6. Have a separate table for desserts. I love a dessert table that has a beautiful presentation, assembled in a way that really shows off the food. This can be nicely done by changing the height of some of the dessert platters. For example, you can create various heights by placing books, upside down dishes, or boxes underneath your tablecloth. Then arrange your dessert platters. 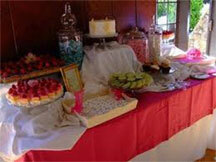 A buffet that is set up correctly will help everyone feel comfortable. The questions will be minimal and you will be assured everyone is getting just what they want. If you have a very unruly bunch, bring a large whistle and a big stick! Just kidding! Everyone will get the hang of it. After you formally welcome everyone to your home, you can explain the buffet setup and process. This will help everyone know the routine you have planned for the meal. So don't panic, this isn't hard. You will in fact have an amazing time and your guests will be astonished at your terrific entertaining skills.